As I was listening to the weather warnings a couple of weeks ago, and looking for distraction from thoughts of hibernating, I found the quote below. 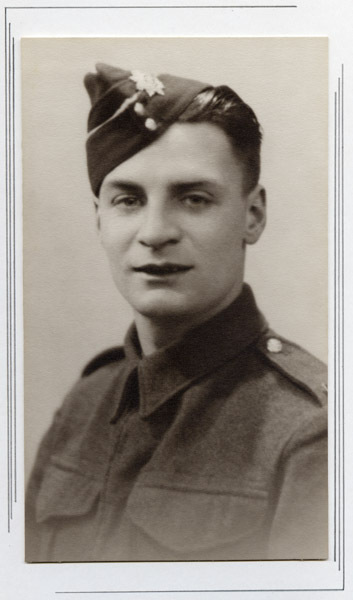 It was not my father who came to mind but my late husband Jack. Today would have been his birthday, and as always, I will raise a glass in memory of those twinkling eyes that captured and warmed my heart. This entry was posted in Family, memories and tagged marriage, Memories, Roald Dahl, Smiling on February 10, 2015 by Grannymar. Monday. It feels like Sunday. Today is a normal working day in Northern Ireland, yet in my head it feels like Sunday. If I lived one hundred miles down the road, it would be a holiday. August bank holiday weekend. I had visitors for lunch. We had a wonderful, happy and cheerful lunch. Buffy brought Elly, George and the wonderful Peter Donegan to share lunch with me. George did the driving and Buffy made sure he was on the right road. It was all over too quickly and they are heading back south as I type. The house is very quiet now. I am sitting with my feet up and reliving the few very pleasant hours. Happy hugs do my heart good! Thank you, Elly, George, Peter & Buffy. This entry was posted in Family, memories and tagged Family, Friends, Fun, Lunch on August 4, 2014 by Grannymar. and simply be happy for what you already have in your life. What am I happy for right now? A friend of mine, over the sea and far away, posted an item on the book of face. She had a glut of fresh free range eggs and offered them to any of her friends. I was sitting down at the laptop for a rest when I saw her offer. I had come in from the garden after an hour of bentoverdoubleweeding, in my efforts to clear the wilderness that surrounds me. Hunger was tapping at my door and thoughts were turning to what I would have for my tea. I could see them with the tops lifted off, the whites nicely set and the yolks a deep rich runny orangey yellow about to spill out and down the side of the eggcups. Slim crisp soldiers in formation around the plate ready to be dunked Now nobody mention that udder stuff or you will spoil my meal and the illusion. Butter never melts in my mouth. Ugh! The very thought of it sends shivers down my spine. So I pick up the phone and surprise my friend by asking if she will send me a half dozen eggs. I could hear her and almost see her falling about her house with the laughter while wondering how she could send a half dozen fresh speckled hen eggs all the way over the sea in time for my tea! She did actually ask that question when the laughter allowed her. Auntie Nancy, a sister of my father, would be 104 if she was around today. She spent many years as a widow in the wilds of Co Clare. She reared hens & geese. On regular occasions a sturdy brown postage box with the word Eggs printed on it in very large font, arrived with our post/mail. It was a made for the purpose box sold at the rural Post Office. Inside were two egg trays, and enough space for two dozen eggs. Nancy addressed the box to mammy, affixed the stamps and handed the parcel, tied with string, to the Post office attendant. Two days later our local postman delivered it to us. All eggs were intact, each one wrapped in newspaper to fill the space and protect them from moving about. Once the box was empty, mammy wrapped it in brown paper, addressed the parcel to my aunt and posted the box back. Those eggs were wonderful and way fresher than any you would buy in the shops today! When Nancy came to Dublin it was usually for the day and involved a trip to Clerys Department Store. There she bought a complete new outfit – from the skin out. The parcels were taken to the “Ladies” where she changed into the finery, put the old clothes in the bin, before heading out to catch a bus to our house. She always carried a leather shopping bag on these visits. It contained at least two or three-dozen eggs complete with half the hen run on them! These had been collected just before she set out on the journey. In the bag, or should I say half in the bag were two chickens. The head and necks hung out over each side while the bodies & legs complete with claws rested in the bag. Their necks had been wrung in the morning and there would be a trail of blood dripping all the way from Ennis to our house! These hens came complete with feathers and innards. Nancy’s arrival on the avenue was announced by her laughter, which was loud and infectious. One year when we were young, mammy was ill and in hospital. Auntie Nancy was looking after us. She cooked, fed us and generally looked after us. Brother No 4 who was aged three and the baby of the family at that time, pined for mammy and refused to eat. He refused to come to the table at meal times so Nancy sat on the stairs and fed him chocolate biscuits. They were the only food he would eat for her. Her idea was that he was at least eating something. Nancy’s daughter Mary married in Worcester, England when I was 15. Dan my father, gave her away and I was bridesmaid. We flew to Birmingham with Nancy for the wedding. It was Nancy’s first time to fly. Being the month of February the weather was rough. We hit a few air pockets and each time Nancy shouted out “Christ, we’re sinking!” and opened a small bottle and shook ‘holy water’ on herself and everyone round about us. Daddy of course was several rows away and pretending not to know us. She shouted out to him “Dan we’re sinking! Do you want some holy water? Here come and get it! We loved to see Auntie Nancy, she was full of fun and laughter. When daddy was taking her to the train in the evenings, we all asked to go with him, wanting to extend the days of fun a little longer. This entry was posted in memories, stories and tagged Eggs, Memories, stories on July 7, 2014 by Grannymar. No. I am not lost! Contrary to speculation, I have not evaporated from the face of the earth (yet), or run away with a soldier, I am just having fun. Fun. FUN! Monday: Buffy learned how to use my sewing machine, then it was time for a long rest in preparation for the busy stuff…. Tuesday: A little retail therapy, finding little gems of shops, all noted for further investigation. Wednesday: It was Ladies Day – Lunching, driving, talking, walking, visiting and even more eating, all interspersed with great big helpings of laughter, hugs and doggy licks. Three dogs in total. Thursday: Today it will be the turn of not one but two Grannymar Toyboys! There is no point in doing things by halves. No. I will not tell you what we plan to do. It might be a looooooooong day! Saturday: I’ll try very hard not to get thrown off a Bridge! It might well be next week before I have time to sit down, draw breath and catch up with all my blog reading and commenting. Here is a little of the Pink to keep you going. All the bicycles (over 1,000) brought to the recycling centre over several months, were gathered, cleaned up and painted pink. There is another tree like the one above, adorning a roundabout/rotary elsewhere in the Borough and umpteen placed on streets, outside or inside shops to celebrate the Giro d’Italia‘s first visit to Northern Ireland. Years ago, before recycling became the norm and a’ money for rubbish’ income for all city and borough councils, we took our rubbish, non bin-able, to the local dump. Renamed, upgraded and money making, they are busy working hubs providing employment and cutting down on lazy dumping across the countryside. This entry was posted in Family, Friends, memories and tagged Fun, Giro d'Italia, Lunching, Pink Bikes, Playing, shopping, Travel on May 15, 2014 by Grannymar. Reading The Incident on the Champs-Élysées at Nelly’s Garden It brought back a memory for me. Over forty years ago I was invited to join a group who were going to Paris for a five day weekend. The dates worked for me and I had a valid passport. So I said “Yes, I would love to go along”! My name was added to the list and accommodation booked, so all I had to do was decide what to wear, pack a bag and turn up at Dublin Airport at the appointed hour. My knowledge of Paris, at that time, came from the movies or books. I knew little more about the small group of girls I was to spend the few day with, all booked into same hotel. In fact The only person I knew on the whole trip was the friend who invited me. We were part of a much larger group, scattered about in different hotels. By the end of the five days I knew at least twenty five by first name and we had plenty of fun & laughter as well as great food, vino and much shorter legs! Our hotel was central, good for walking from place to place, quite small with lots of stairs. Thankfully we were booked on a Bed & Breakfast tariff, so once we came down those stairs, we returned no more that once in the day and that was usually to freshen up and change before dinner. Arc de Triumph, Eiffel Tower, Champs Elysées, and Place de la Concorde, where the guillotine took the life of King Louis XVI and Marie-Antoinette, and where today Tour de France runs its grand finale. Notre Dame Cathedral where, because of the great number of tourists, I did not feel the spiritual magic of the cathedral, but enjoyed the quirky, funny, scary, and spiritual details of the artwork and the architecture. All those Gargoyles and flying buttresses were something else! We drooled our way along Place Vendôme – where owning a store is a haughty statement and every shop window is worth over €1 million. You may remember Place Vendôme the 1998 movie starring Catherine Deneuve. We however, moved on and found time and shops with prices more suitable to our fast emptying purses. We allowed more time for The Château de Versailles, which 30 years ago was added to the UNESCO’s World Heritage List. I have visited again (when Elly lived in France) and my memories of Versailles are from that time. We explored back-streets where ordinary tourists don’t generally venture. We felt the real Paris as we passed elegantly dressed young mothers escorting their dancing or skipping young children to or from school or kindergarten. We found time to eat, drink and pause to soak up the atmosphere and one evening we went to the movies. Last tango in Paris, had been banned or cut to ribbons by the censors in Dublin, so we wanted to take the opportunity of seeing the film in Paris. We found a cinema with the film in English so booked for a late showing. We returned along the Champs-Elysées late that night chatting animatedly about the movie, on the way to our accommodation. The street was busy with people walking in both directions, when a man bumped heavily into me. He almost knocked me over. He mumbled and staggered past, and as I looked over my shoulder I saw him lurching through the crowd behind me. We walked on, I had no handbag/purse to think about. My money was in my gloved hand, a trick I learned from my mother. It was only when we got back to our hotel, that I discovered I had blood all down my new, first time airing – dry clean only -trouser suit. We were going home the next day so the stains had to wait until I reached Dublin, to be sorted. We never discovered the ‘what or why’ of the incident, from the amount of blood, I assume the guy had been stabbed. This entry was posted in memories, Travel and tagged Memories, Paris, Sightseeing, Travel on April 14, 2014 by Grannymar. It was a Monday morning, just six days before Easter Sunday, that Eileen arrived. The path was prepared and pattern set by her almost four year old brother and sister aged two. By the time she was twelve, the family had reached the full compliment of seven children and her mother and father. They lived over the corner shop, owned and run by her mother. Her father was a Cooper at a local brewery. Eileen’s father was a quiet serious man not known for a sense of humour, yet Eileen was the only one to get away with devilment. As a young girl she was diagnosed with an acute appendicitis and her father walked with her from the South Circular Road, in Dublin, to the Meath Hospital, for admission and surgery. Once over that hurdle, she never looked back. She had the quick wit of her mother and a head for figures, a gift her mother put to good use in the shop. Back in those days customers often paid for the groceries at the end of each week, so records were hand written into a large book. Eileen quickly mastered the cross and long tots, which eased the load for her mother. 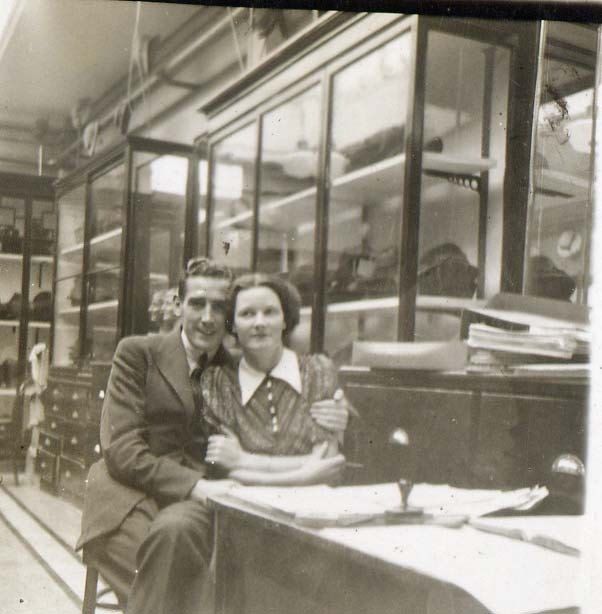 At sixteen she left school and went to work at Cassidy’s Ladies Fashions in George’s Street in Dublin. She never complained, but she knew she was going to work so that her brothers could be educated. She had a good eye for fashion and particularly hats so was moved to the Millinery department which she loved. In those days, unlike today, ladies hats came in different sizes. The were stored in large deep drawers or glass cabinets. Eileen at work in Cassidy’s. She was light on her feet and loved to dance and was never short of a partner. Lilly, one of her aunts, was a wonderful seamstress and took great pleasure in creating dance dresses for Eileen. 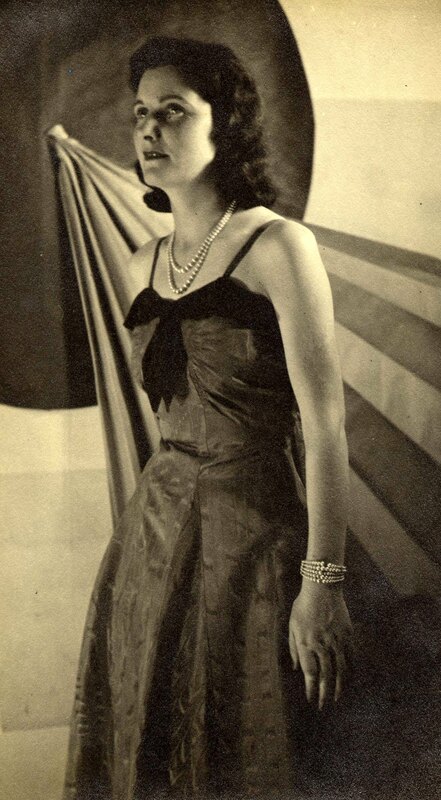 She often told of a green fabric she saw in Denis Guiney’s window, on her way to the Custom House, On the way back she went to purchase enough for a floor length dress. The grumpy salesman told her that since it was in the window she would have to come back the next week when the displays were changed, he could not remove it before that. Years later he said he remembered that day and thought the colour would look well on her! That grump became her husband and my father! 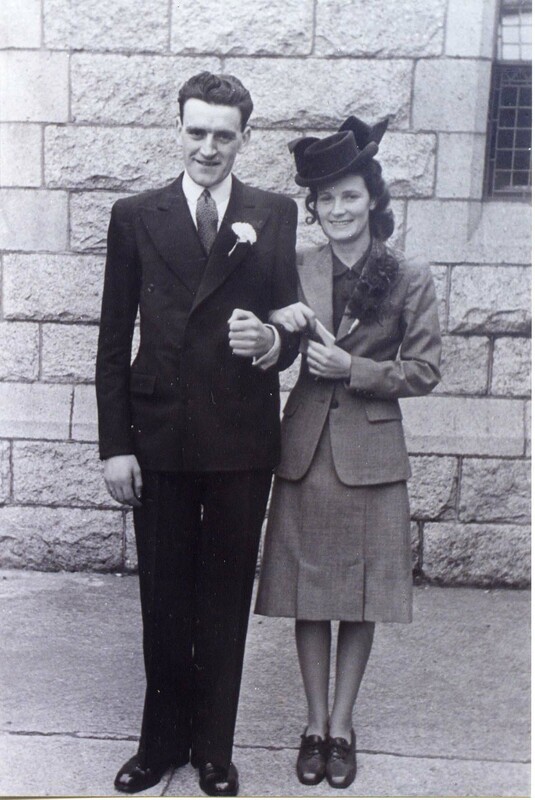 Mammy & Daddy on her wedding day. With time they had a family, but it was not all an easy journey. Of her nine pregnancies, her first and penultimate babies were still born and the third survived for five hours. The remaining six are still going our various ways, having nurtured our own families and for some there is another new generation following on. 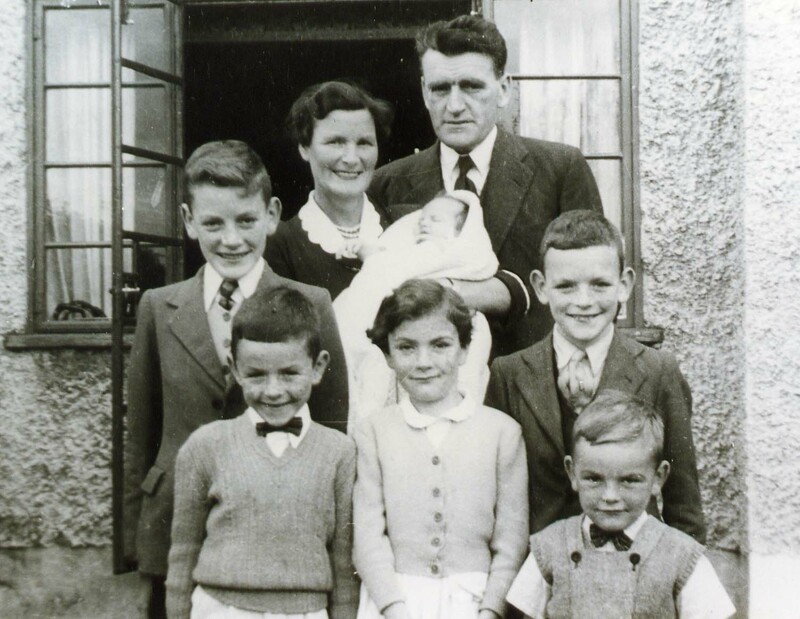 Two years after the birth of my sister, the baby in the photo above, mammy had a serious heart attack. To her horror she was not allowed to eat butter, fat or cream, she was to cut out using the stairs e.g. come down in the morning and not go back up until bedtime! The loo was upstairs, What was she supposed to do…. Tie her legs in a knot? 😡 She was not to stand if she could sit and not to sit is she could lie down! How those ideas have changed! It is just as well, since mammy had little chance of sticking to them. One year later Daddy was ill and in and out of hospital for a year. Mammy’s health issues were put on the back burner while looking after him. They both kept going, with health lifting and dropping like a temperature gauge. Despite all the hurdles, mammy never lost her sense of fun, She became a great cook, a wonderful mother and great friend. So to day on her Hundredth birthday, may we all drink a toast to her memory (tea would be appropriate, it was her favourite tipple), share the happy memories and listen carefully for her laughter! This entry was posted in Family, memories and tagged Birthday, Century, Family, Family history, Mammy, Memories, Nana on April 6, 2014 by Grannymar. In recent years I have the joy of sharing with new readers and some of you may not know the tales from the early days, therefore, I reproduce an old Post first published in November, 2007. Well, if the TV and radio stations can repeat a programme, why then not rehash an earlier post? I suppose you think a wardrobe is for storing clothes? One wet and windy winter’s afternoon the door burst open and a tornado landed in the middle of the living-room floor. There was a loud rustling sound as Jack lowered the newspaper sufficiently to peer out over the top. With his glasses resting half way down his nose and not a sound or trace of a smile, he looked from the voice to me, wondering exactly what was going on. “Your Daddy is here reading the paper so he can’t be in the wardrobe?” I said. There was nothing for it but to set my needlework down because when this young lady got something into her head the devil himself couldn’t shake her off course. She took my hand and dragged me out of the room. The newspaper was lifted once more and I heard Jack quietly whistling behind it. Off I went to find out how a man got into my wardrobe. I moved the clothes along the rail to have a better view. Right enough her dad was on the floor propped against the wall at the back of the wardrobe. I carefully lifted him out and touched his face as I did so. “Don’t put him back in there” she said, “I think you should hang him up on the wall”. I did hang him that day, and he has had pride of place there ever since! This entry was posted in Family, memories, stories and tagged Family, Memories, stories, wardrobes on April 5, 2014 by Grannymar. I imagine your days are busy with the endless round of chores that go with young motherhood besides sorting, packing and deciding what to keep or discard before your move. One tip I suggest: Do not throw out all the ‘Fridge Artwork’! Let me explain by showing you a special piece of Art. The work is unsigned, but dated. Look carefully at the top right corner. Libby, do you recognise the hand that wrote that date? The date: 11/3/83 was written by your father’s hand. Thirty one years ago this month. I supplied the very high class art paper! Not entirely true, but close. Thirty one years ago, we had no PCs in our little world, Jack received reams of printed or typed paper in the mail twice or three times a week, all in relation to his work. The old sheets were scrapped when the next bundle arrived. What a waste. I suggested keeping the paper and allowing Elly use the pages to draw, write or scribble on. It meant she had an endless supply. One day Elly presented me with a picture that really impressed me and it gave me an idea…. On our next visit to Dublin I had a bundle of spare sheets for Elly to play with. 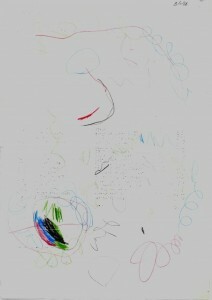 One day, seeing all of her cousins around her, I thought it might be interesting to see what artwork they would produce. I gave each child a sheet of paper to take home and draw a picture for me. I was not leaving you out, so I gave your dad the page. The work above is you handiwork. Very delicate for a tiny toddler! The colours show better if you click to enlarge the image. I played with the lines and circles of your piece. First I took tracings, eliminating some and keeping others. Then began the fun of layering the lines until I was happy with the result. Next with your colours for inspiration, I delved into my craft box. Several pieces of sequin off-cut and coloured tulle were light enough for your touch. I layered them together, worked some free machine stitching before cutting away at the layers to show the different colours and textures. The ink spots from the type on the other side gave me the idea to add beads. And the swans-down & frayed threads were for the softness of a tiny hand. Elly’s picture led to the whole idea in the first place. Click on the link to read the story of where that led. This entry was posted in Crafts, Family, memories and tagged Children's art, Crafts, Family, Memories on March 21, 2014 by Grannymar.